Q. Nearly 98 percent of the most valued brands, 100 percent of Dow Jones top scoring sustainability companies and 87 percent of the Forbes Global 2000 companies are your customers. Where from comes your future growth? As our product portfolio is a lot broader than it used to be, a lot of our growth will come from growth in the same-account revenue [existing customer base]. Over the last six years based on the innovation that we have put into the portfolio, if you look closely at our same-account revenue growth you can see 80 percent of our revenues are coming from businesses where we were not there in five years before. Within our existing customer base we are having an amazing cross-sell and up-sell. Yes, this is because around the world, SMEs are an imperative part of our business strategy. For instance, India has been the third largest startup ecosystem in the world for SAP and we have only just begun. In spearheading the SME marketplace, I am individually taking the role of leadership. To enable them to grow faster, we have to use cloud computing. In India, it is a very big opportunity. Q. In what way, your business has been impacted due to the global slowdown? How can a downturn help you? SAP is very relevant whether you are just trying to mark your business simple and efficient or you are growing. In India or outside, all the CEOs will tell that a digital boardroom is mandatory so they recognize what is going on in the business from the supply chain to the customer relations. Due to this than all the additional significant enterprise technology companies we have grown much faster. We have now attained about 100 million users by making a bold move in the cloud [business]. The cloud is actually moving faster that it has been thought of. The business network is finally what that is actually growing fast. The companies have been forced to realize that they have to be digital not only within their company but also with their trading partners by this idea of a global economy with fragmented supply chains. Q. Are you planning to raise the share of cloud business from 11 percent to 29 percent by 2020? Yes because, the cloud business has been exceptionally good. In the cloud, companies can now run their whole core business. HANA Enterprise Cloud, offered by SAP is a faster than any other platform of data, so you are enabling a live system strategy and a real-time and it runs on a twelve-and-a-half times less hardware than other cloud-based technology. Because our lines of business [various industry verticals] clouds are faster to value, easy to consume, and are the best; therefore they continue to grow extremely fast. HANA Cloud Platform, the most recent development can take our data platform and get it into your enterprise or we will operate it on our cloud for you. Thus, this platform will be a fastest growth model. The customer has to win therefore, what the customer wants, the market should get, and this is what I have believed in always. A sharp decline in margins and operating income has been announced if you look at current earnings announcements in our space of other companies. In reality, their core business is adverse in double digits and they have abandoned their operating income. That is because at the expense of operating income, they choose to publicize their growth in the cloud business. I think the more pertinent way to look at is to show progress on the operating income side and to retain your core business tough and to develop your cloud business. Q. To move their core operations to the cloud and to give up control over their data, how open are the companies? Customers are worn-out of buying hardware. Lots of people are required to back the hardware. The recurring expenses are high. If not managed properly, this is unsustainable. In addition, apart from protection from technological obsolescence, cloud offers economies of scale and scope. So, why people will not go for for it? Q. What gives you sleepless nights although SAP is almost unhampered in the market? Is it competition, technological disruption or fear of complacency? Fighting complacency has been a part of all successful companies. In 2010, when we broadcasted our strategy, we basically said we will improve people’s lives and assist the world function better. It is regarding keeping alive the trigger of innovation where individuals serve not only to their customers but also to their customers’ customer. Due to this, our software has to be easy to consume, attractive to use, and mark their day better. 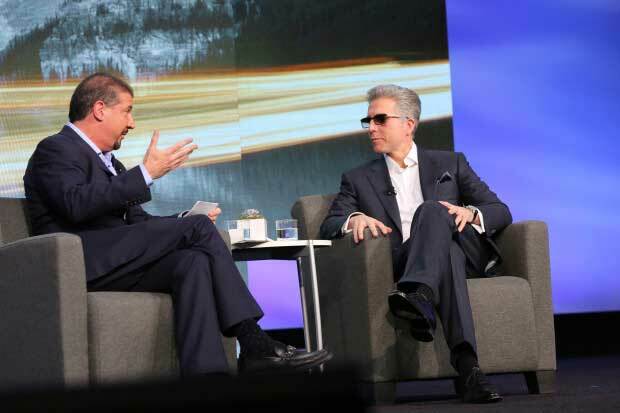 To keep that promise and the superiority of a company like SAP is certainly not simple. You need to manage 77,000 people to move as one and thus it is challenging. Q. In what way do you pick up emerging trends by keeping your ears to the ground, and be ahead of the curve? Companies like us must be aware constantly of the fact that new ideas are coming from each area and whether the idea is a new idea. From within a company’s planning process, advance ideas usually do not come. That is why we look all over the place and corners. We invest in startups or look at universities with fresh brilliant minds or are recognizing new ideas that can provide as new categories joined with current businesses. A billion of dollars have been put in separately for this. All this makes us relevant. An idea can turn out to be a billion dollar business quite fast for a company like SAP, which is present in 190 countries. That is why I am looking for the subsequent billion dollar business chance constantly. Q. How has SAP been in India for 20 years? It is time to strike the accelerator as we have been doing very well in India and has been at a modulation point. Narendra Modi, the Prime Minister of India has a big dream as Digital India is real. I met with the bests of some of the most important and biggest companies and they understand about the Digital India totally and are after it. Digital India is promising only with an incredible partnership and collaboration between the private sector, the best technology companies’ and public and that is what I strongly believe in. We are exceptionally placed to do that with the trust India has in SAP. SAP has been the rapidly developing businesses in India. In the revenue stack rank, India is in the top 10. The jinx of a business person is to relate him to what has taken place historically is something that I keep reminding people in SAP. The new world that is yet to be won is Asia. Within Asia, India is the most important market. So what needs to be done is to redouble investment, our focus, management talent leadership, and all what India has. The companies that capture the Asian market will be the ones that will function in the world and companies that miss it will be ‘losers’, when I look back at the era between the early 21st century and the early third of the 21st century. For SAP, India and China will be amid the top five countries internationally in the next five years.